I got the increasingly rare opportunity to attend a Buck-O-Nine CD release show last Saturday at their, and my newly re-adopted, hometown stomping grounds. The show was at The Casbah, a downtown San Diego ska friendly staple. It is a great little venue, perfect for intimate shows with your favorite bands and the 24oz. cans of PBR aren’t stupid expensive. As a bonus for attending the show, every ticket holder received a copy of Sustain, their first new release in seven years. For fans of Buck-O-Nine, you wont be disappointed. As far as I’m concerned the disc is an instant ska classic. The songs are tight. The horns hit. They can hold muster to a couple adult beverages and remain dance-able. The shout along choruses are intact. If you are new to ska, (wow that cave must have been crazy dark and quiet all these years) dig into their back catalog. There is more good stuff to be had. What more can I say about the disc other than it is a great piece of work from one of my favorites and now on one of my favorite labels too. For those that didn’t get to attend the show. 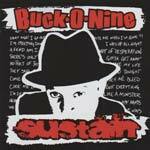 Buck-O-Nine was opened by another local ska act, The Lifters. They too put on a great show. Check ’em out if you have a chance.